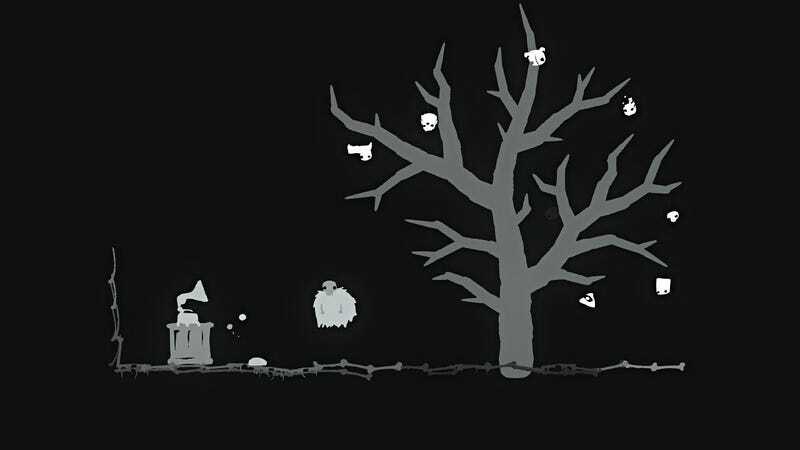 Creepy-cute roguelite platformer shooter GoNNER had been on my radar since coming out two years ago, but it was only last year, with its release on the Switch, that I finally got it. It’s a fun game! As a piece of Switch software, though, there are some things it might stand to do better. Maybe it’s a weird line—one between feelings about a game versus the nuts and bolts of the UI/UX (user interface/user experience) surrounding the game—at which to draw a distinction. Arguably, they should be one and the same! And in cases where it’s heinously bad enough to majorly get in the way of gameplay, like maybe an RPG or fighting game gear inventory menu that’s too tedious, confusing, and/or time-consuming, it pretty much is. However, the latest crop of Super Smash Bros. games, especially the 3DS version, also had some pretty horrendous menus going on, but I have not ever found them so hampering for me to consider it as a major knock against how good the gameplay is. Its bad UI tendencies are more separate from the sheer fun of Smash Bros., in my book. I find GoNNER on the Nintendo Switch to be at a similar level to that. In all its brutal, unforgiving glory, I’ve come to really appreciate it the longer I’ve played! However, it’s also far rougher than all of the other games I have for the system, third party titles included. Its issues largely don’t get in the way of the game, thankfully, but they are still frustrations that are annoying to deal with. Controls cannot be customized, actions cannot be remapped to other buttons. This is not the kind of thing that I’ll notice if the default control scheme already fits my personal playstyle. The controls for GoNNER as introduced in its tutorial, though, don’t completely fit that bill. GoNNER does something else entirely—jump with the right button, shoot with the top button, and use powerups with the bottom button—and it scrambles my brain. The way jump and shoot get assigned, were it only them, would not be too bad, but having the powerup button where I usually associate jumping?! Now, if the game had options for customizing the controls—like Super Smash Bros. 4, for example, whose default Pro controller scheme is puzzling but not set in stone—this would not be a problem. But it doesn’t. So for a good moment there, I had to face the prospect of being stuck with this counter-intuitive button layout. It didn’t feel especially great. Thankfully, I found out a little later that I could also shoot with the right ZR trigger, and I’ve gotten comfortable with jumping with A, shooting with ZR, and using powerups with B; given at least one of the skull types, in fact, that may even be the ideal way to play. Still would be nice to have an actual say in what the controls are, though. Game performance occasionally craps out at random for a split second. Sometimes, I’ll just be playing a round, and then out of nowhere, the game will freeze up, and then when it unfreezes, everything jumps ahead, most likely from a hitch in the framerate. This actually does occasionally get in the way of gameplay, especially if it leads to getting damaged without being able to do anything about it. At least it does not pop up so much that it’s constantly ruining the experience. I cannot speak for if this is some sort of general optimization problem with the game on all platforms, or if it’s an issue specific to the Switch version. Regardless, it sometimes becomes a problem. Playing GoNNER in tabletop mode is a bigger hassle than it should be. This is the strictly user experience aspect of the game that disappoints me the most, because it goes directly against one of the Switch’s fundamental strengths as a game console. I’m one of the seemingly rare players who often prefers tabletop mode with the Pro controller over playing in handheld mode. That said, my most ideal way to use the Switch is to always have a pair of JoyCons attached so that going to and from TV, tabletop, or handheld modes on the fly, if need be, is never a hassle. With most games, playing in tabletop mode with my Pro controller even when JoyCons are still attached to the sides of the system is no problem. That was one of the most pleasant surprises during the earliest stages of having a Switch; a lesser system would likely force you to take out the JoyCons before it would recognize that you want to play with the Pro controller instead. This one rises above such nitpicking! Well, except when GoNNER is involved. If the JoyCons are attached while the Switch is not in a dock, then the only way to play the game is in handheld mode. Even if I turn the Pro controller on, even though it will pair with the system just fine, GoNNER won’t respond to it. This actually led to a minor freakout when I first started playing it, because it made me think that the game may have been hopelessly bugged out on account of being unresponsive. Then, I realized: If I take the JoyCons off the Switch first, then the Pro controller will work just fine. Which happens to be the exact kind of hassle that I never wanted the system to force upon me. All indications are that it has to do with how the game implements things. When the JoyCons are attached while the Switch is off dock, it seems like the system automatically assigns them the role of Player One. Where GoNNER is concerned, I think the game may be polling to see who Player One is, sees that it is the handheld-mode JoyCons, and then automatically ignores all other input from controllers that aren’t deemed to be that first player. Though an understandable decision that may simplify things on their part, it also cuts into the matter of players’ choice of controllers in a way that most other games manage to avoid. It ultimately doesn’t affect how fun of a game it is, but it does directly hamper the modus operandi of the Switch. This is the only game I’ve encountered so far that treats controller assignments like this. I hope that it’s the last. How about I now turn this discusson over to you? You have any games that you like—maybe even love—but are riddled with UI/UX annoyances?